I however think that it also depends on the general status of the sta"m (i.e. 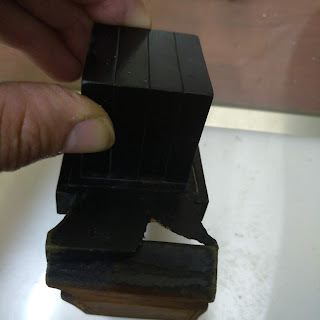 higher quality sta"M we are quicker to make fixes than we would if it was cheaper quality sta"M.
What should a magiah need to fix when checking? Both matters which are posul, fixes like hosafas dio when necessary, and smaller problems including [but not limited to] missing tagim of Bedek Chayah and shatnaz gatz. Yes, this is the obligation of the magiya who fixes to bring the mezuza/tefilin to the standard of lechatchila kosher according the din. b) or it is accepted in the locale that the magiya's responsibility is limited to seeing the mezuza kosher bdieved [thats what they pay for only]. 1) The more the unnecessary fixing the higher chances there are to also potentially posul chas veshalom. 2) It also depends on the general status of the sta"m, i.e. higher quality sta"M we are quicker to make fixes than we would if it was cheaper quality sta"M.
The last point is very correct - it is very difficult and sometimes meaningless to demand a magiya to fix lechatchila things, when the whole csav is bdieved. Whats the gain? so why the tircha, and potential paseling!! 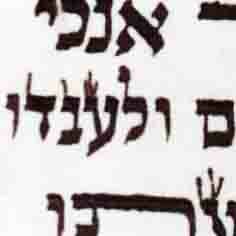 "(I don't know if the tagim of shem on the back of the mezuza, are from the din. The laws of writing this shem are very shaky!!)" R"Moshe Could you please explain, since a magiah is obligated to fix to the standard of lechatchila, also tagim Shatnaz gat"z on the back of the mezuza should be added, since although not meakev it is still lechatchila necessary? I don't know if this shem has the (complete) laws of writing. See SA Harav 32:5 "csiva tama ... tagim" - seems to apply that tagim are part of the law "tama" which apparently doesn't apply at all to this shem. Even chakika is not pashut to say that it is pasul, there seemingly [to my knowledge] is no source that this shem has any law of csiva. This may resemble the machalokes in regard to the shin on the batim shel rosh - if they have the laws of csiva, which we are mehader not to do the shin through chakika, but the hallacha permits, because this shin doesn't have a law of csiva. Notice also that many customs [as chabad] dont make tagim to this shin. If a mezuza is in darga of lechatchila i will fix all that was missed or cracked. OUR POLICY"We do not upgrade Tefilin Or mezuzos.if you purchased amezuza without bedek chaya we will not upgrade it -we will notify you its not lechatchila. as per how the grading system works lets leave for a seperate post. I would like to hear what other magihim feel about new parshios with negios and missing tagim etc.-when do you fix and when do you return to sofer. I will do a moderate amount of fixing to upgrade it to lechatchillah without extra charge. If it is a lot of fixing (but fixable)I may charge a few dollars extra. In many cases the parsha is overall lechatchillah but may have only one or two bedieveds that lower the status (such as a short lamed or touching /missing tagin etc) in which case it is a given that you fix these. Bais Hastam, granted missing shatnez gets are bedieved (lebracha), but is missing bedek chaya bedieved (lebracha)? What is your source for this? While it is not lechatchilah leksivah I should think it's still lechatchillah lebracha. Eli,you are right,I actually call lechatchillah lebracha "kosher". 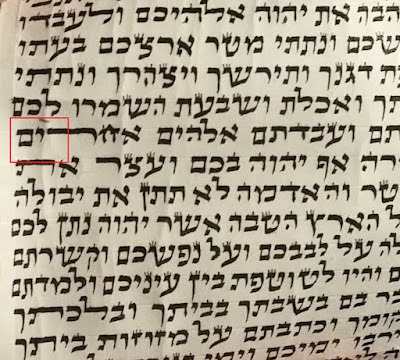 i grade kosher lechatchila if its written in a way that nothing needs to be fixed. I grade mehudar when it was done right in the first place-also if fixed a nifsak which is machlokes prm"g and ra"e it can be lechatchila -not mehudar.